Are you an employer or do you manage employees? Do the financial challenges of your employees sometimes spill over into the workplace and have a negative impact on your bottom line? Today, we look at the impact of personal finances on work productivity and what you can do about it. Every day, employees are faced with financial challenges and their sometimes naïve and misguided attempts at finding solutions cost them and their employers heavily. 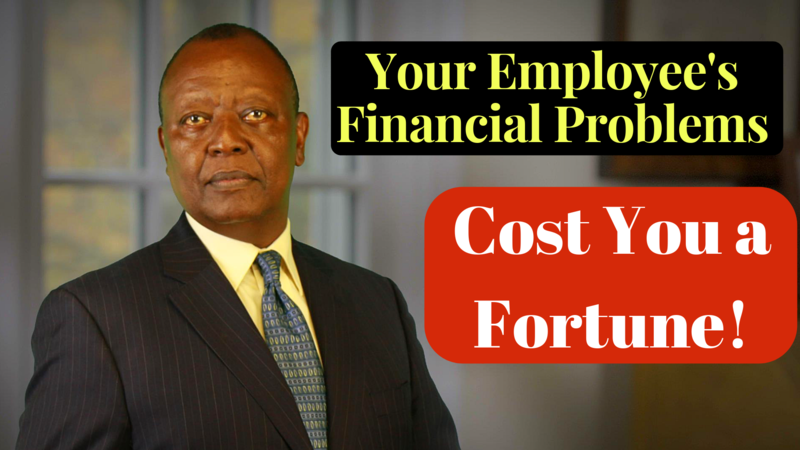 Poor financial management of your employees impacts you in several ways. First of all, it affects them directly. This leads to absenteeism and tardiness as they work out financial problems, accidents in the workplace or on the road may occur due to lack of concentration, the employer is pressured with constant demands for pay increases, demands for loans and advances and often, there is outright theft or misuse of organization resources. There are also Indirect effects. Low morale, poor customer service leading to loss of customers who go elsewhere, increased stress at work, increased worker compensation claims, increased medical claims, increased abuse of alcohol and drugs, lack of focus on duty, moonlighting, loss of qualified employees leaving in search of higher remuneration. The list is endless. All this has a direct financial cost to you the employer so what can you do about it? An effective personal financial training program will improve the behavior of employees and reduce the likelihood of financial difficulties and the resulting negative effects on the employer’s bottom line. After implementing a personal financial education program, employers find that employees have more financial success in their personal lives and are more likely to develop a better comfort level with their pay and appreciate their employer benefits as part of their total picture. An ongoing personal financial education and counselling program as part of the normal employee development program or employee wellness program should provide help for employees to develop skills in making informed choices to improve their financial wellbeing. Indeed, personal financial education may be the single most important employee benefit you can offer, because it integrates and enhances all the other benefits. It is also a vital life management skill that can enable employees make the best use of the fruits of their work and remains useful for the rest of their lives. Challenges with personal finances torture a huge silent majority. Most employees do not know how to plan their finances because they have never been taught. The average employee firmly believes that their employer holds the key to their financial future. In their heart of hearts, they are convinced that all you have to do is increase their pay and all their problems will disappear; they will have wonderful homes, their kids will get the best education and their financial security in their old age will be guaranteed. This is a delusion that needs to be dispelled. Although most human resource professionals acknowledge the problem, most do little about it because of some incorrect perceptions. They think it will cost too much, it will disrupt work schedules and that finances or a personal matter. The truth is that workplace financial education has been shown to produce a ROI of 3:1. Furthermore, an online personal finance training solutions, such as my Moneyskills online personal finance course, will ensure there will be no work disruption and usage can be easily monitored and tied to performance evaluations. Most importantly, there is nothing personal about the personal finances of your employees if they keep losing you money every year! So my message to employers is; help your employees improve their financial management and you will benefit massively by increased productivity and morale in your workplace. This may prove to be the best investment you will ever make!